I’ve been procrastinating this post because, as those who have followed me for awhile know, I greatly detest the planning part of hiking. There is a lot here, but it’s all really great information I know you’ll all really apprecite! The good news about the Appalachian Trail is that there is very little planning required! I could have shown up at Springer Mtn, GA (the southern terminus) with just my gear and a few days of food and I would have been fine. I still like to be prepared and have a general plan, so here is what I’ve done over the last few months in preparation for walking 2, 185mi from Georgia to Maine. 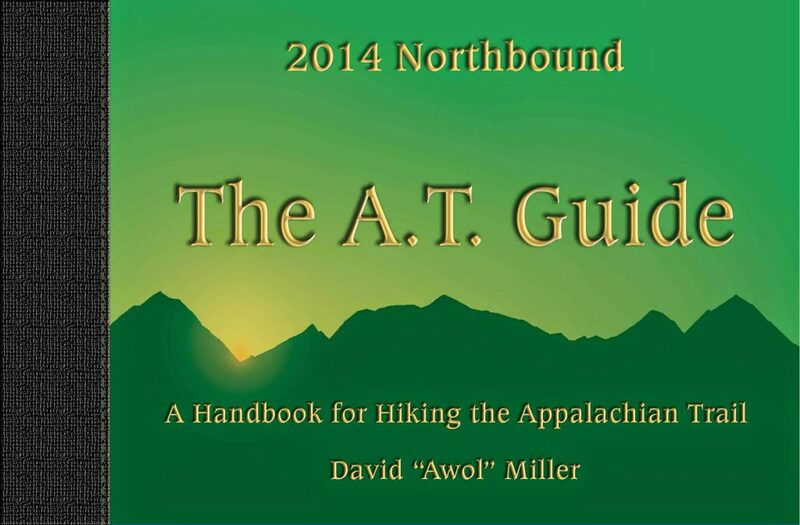 The most popular guide used for the AT is Awol’s A.T. Guide. Hikers absolutely LOVE this guide and most don’t even carry maps because the trail is frequently blazed (marked) with a white blaze on the trees. You’ll notice if you get off trail because the blazes will be a different color or not there at all. There is even a digital version that came out this year to keep on phones with direct links to sites and phone numbers. Before that came out, I had already scanned the book so I have the whole trail with me at all times and I don’t have to worry if I lose a page or miss a resupply box. 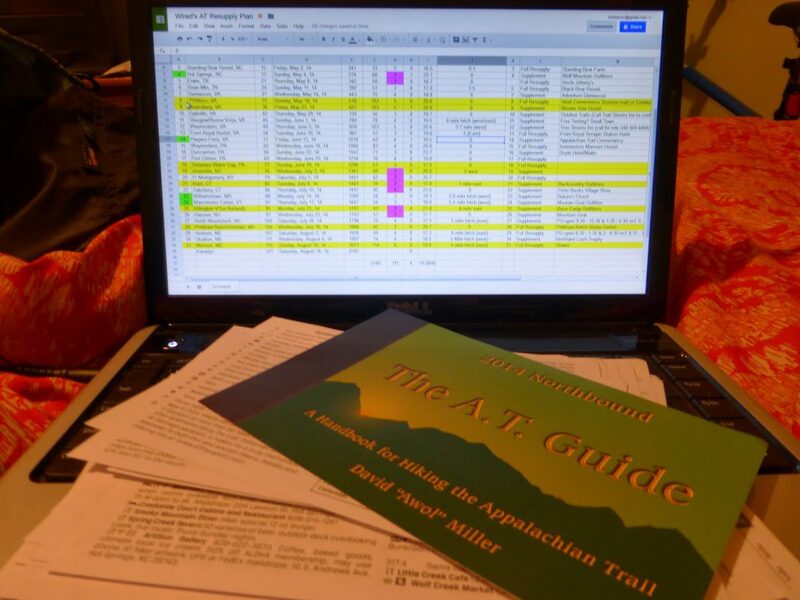 I will mention that another guide has been made by the Appalachian Trail Conservancy in an effort to have the funds kick back to the trail more directly, but user reviews thus far say it is not up to par with the A.T. Guide and needs more improvements. Here are two pages so you can see how the A.T. Guide is laid out. The guide can be bought northbound and southbound. The pages are the size of a half sheet of paper, printed double-sided, and can be purchased unbounded to use as loose leaf pages. It’s like a data book that lists significant sites and locations for shelters, water, towns, viewpoints, roads, parking, side trails, etc. There is also a nifty visual of the elevation to see how much torture you’re headed towards. 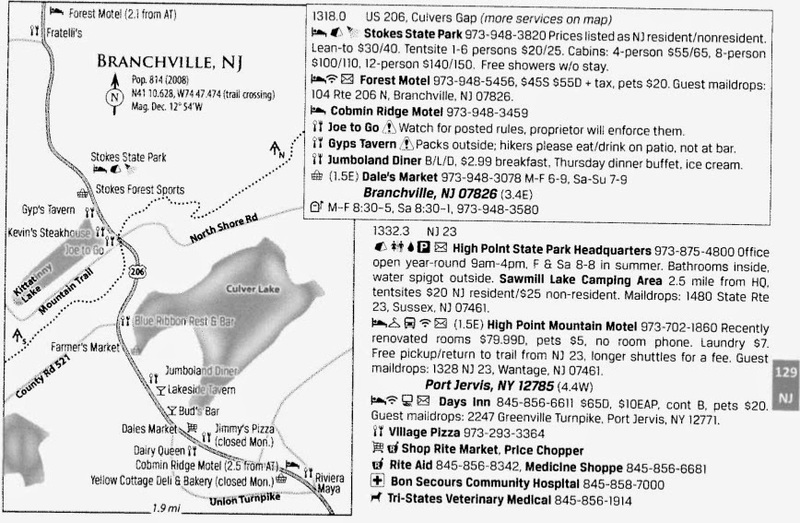 There are town pages with information and contacts for the major towns along the trail. So far, the only improvement I would suggest for the guide is for it to have a general overview section where hikers can see the order of towns and distance between them and page numbers to locate them. I don’t know the area and it made organizing my resupplies and schedule very time consuming. On my previous trails, I’ve put together resupply boxes that my step mom, Robin sends me so that I don’t have to take the time and effort to shop in towns. For the Appalachian Trail, sending resupply boxes to every town can cost you more than it’s worth. 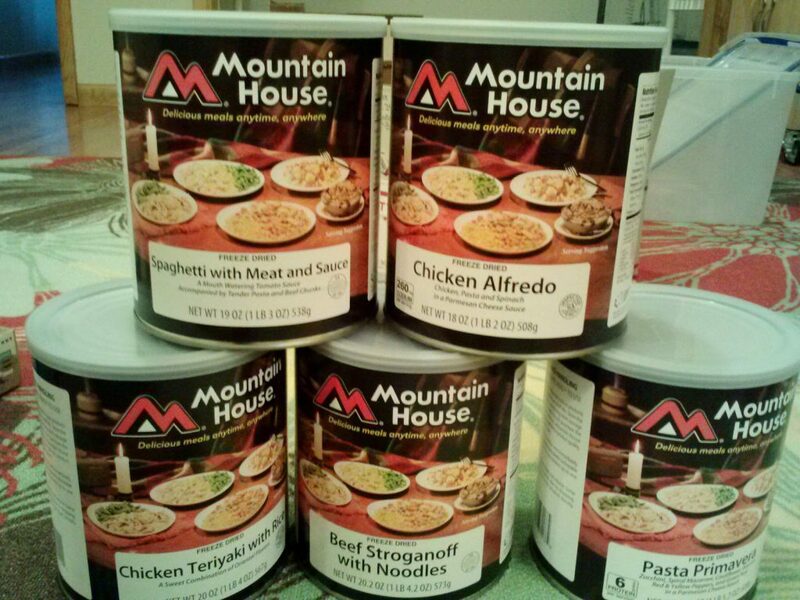 My friends that have hiked the trail say there are many times that you arrive to town and still have an abundance of food due to all the trail magic and opportunities to buy meals as you walk through towns. There are only a few towns where it’s recommended to send boxes along the AT, but for the most part, the trail goes right through town and by a grocery store that is stocked for hikers. It is very appealing to my side that hates planning to not do resupply boxes. However, I have the unique fortune of having many blog followers send care packages as a support and thank you for all the blogging. 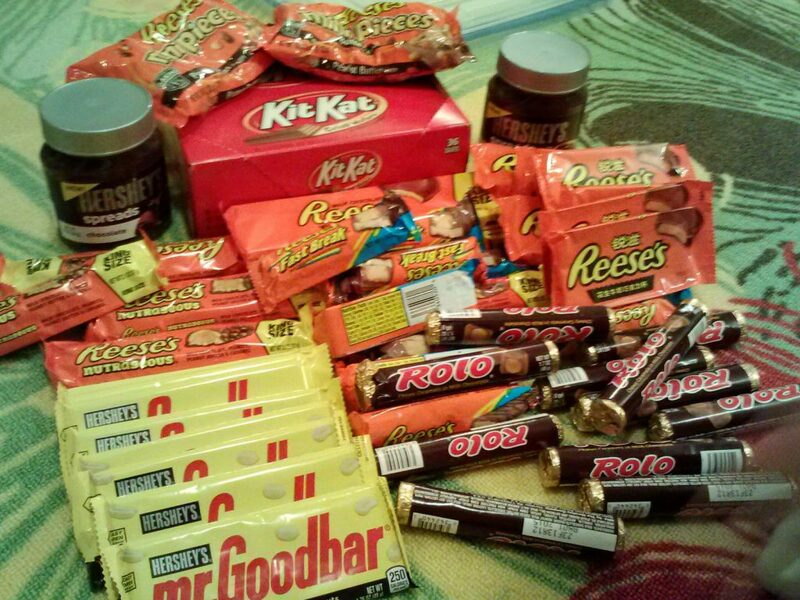 You all are AWESOME and it is really fun for me to get these care packages! After three trails, my Robin and I have this down to a science at this point. All care packages are sent to a PO Box I have posted on my site that Robin checks. She then spreads out over multiple resupplies. The strategy for the AT is to send boxes if there are care packages to be sent and I’ll supplement the rest from the local grocery store. 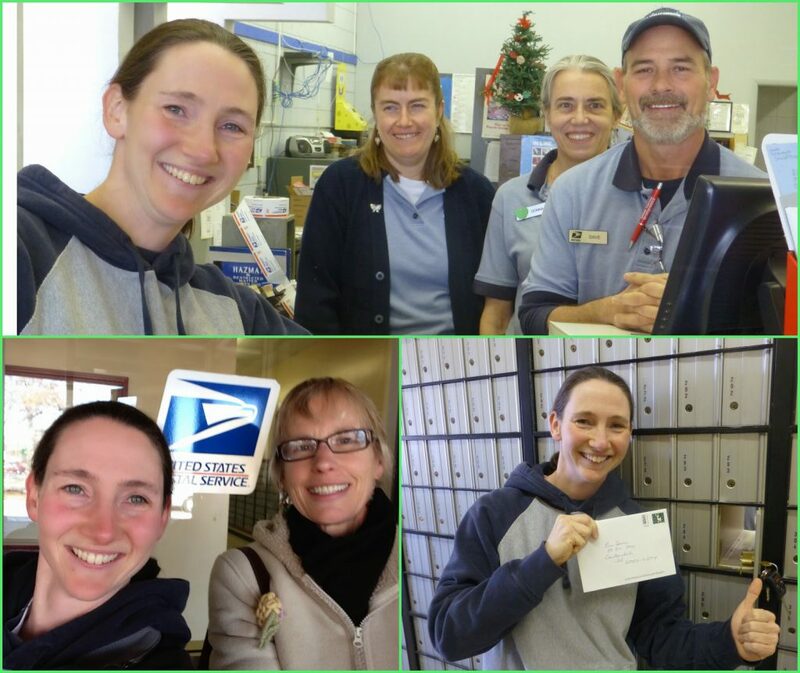 Visiting my Care Package PO Box in S Illinois with Robin! Resupplies with Robin & Bubby! even had a letter in the PO Box waiting for me. So fun! 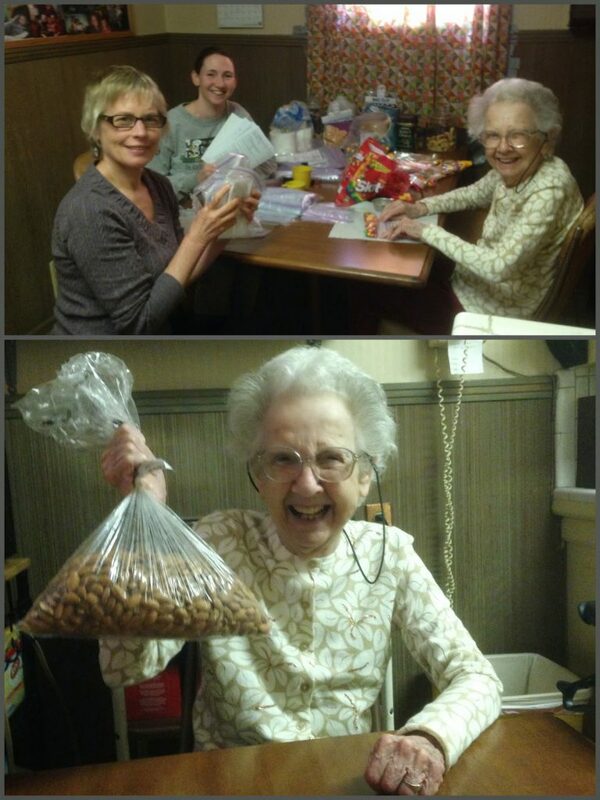 got in on the action and helped portion out things! I want to share two of the coolest care packages I’ve gotten. One of them is from a fellow PCT 2011 hiker named Malto who lives and works in Hershey, PA…at the headquarters for Hersheys Chocolate! Malto is going to give me the full tour of Hersheys when I go through PA and sent me a 12lb box of Hersheys chocolate products that I will gladly eat before they melt on the trail! 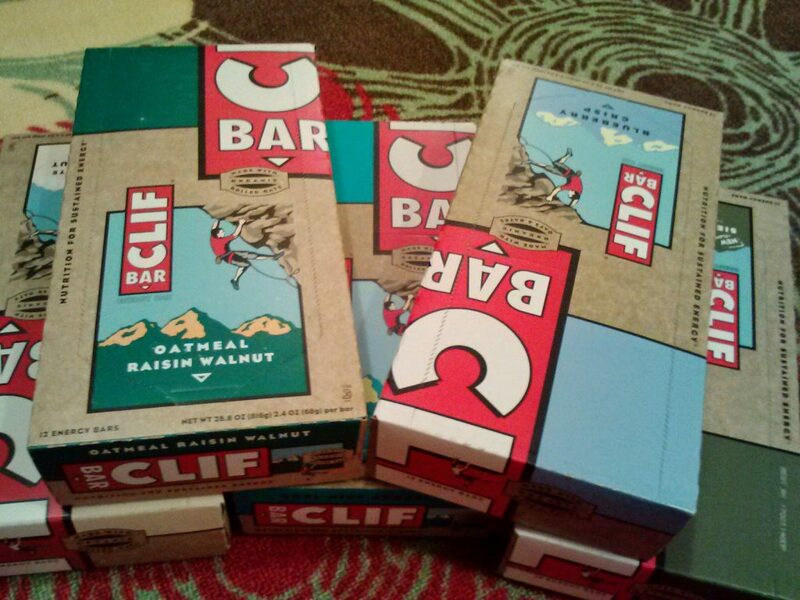 The most recent surprise I got is from my friend Dan, who is the father of a PCT 2011 hiker and has sent memorable care packages for each of my hikes. 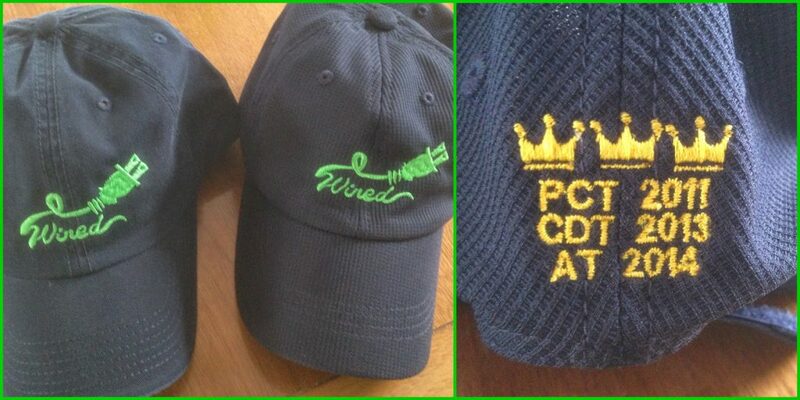 Just the other day, I got his most recent gift…two embroidered Wired hats in my Wired colors! I want to thank Precision Embroidery & Digitizing for finding a way to make these off a scanned photo of my Wired stamp. They are absolutely perfect! One of them I will wear on the trail and the other one is to be saved for if/when I finish and has the triple crown on the back…SO COOL!!! I also want to remind everyone that my stamp was created by my friend Funhog who is a wonderful trail angel that can make personalized stamps for other hikers too! I won’t be carrying maps with me, but I like to have something to visually see where I’m at and help me out if I get turned around. 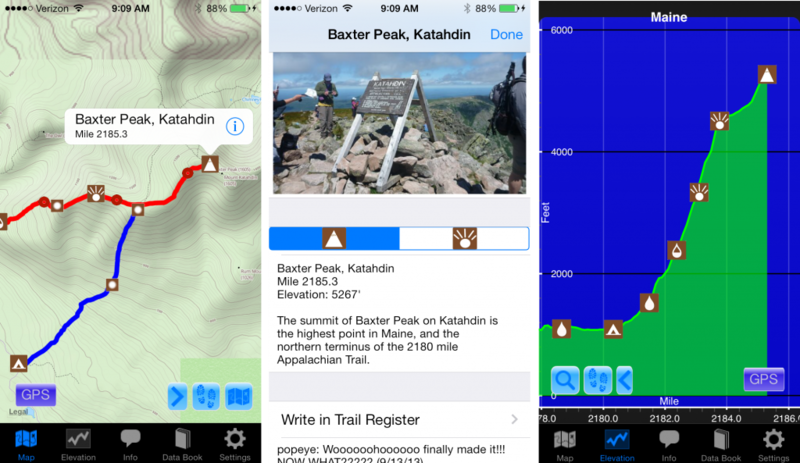 Fellow Gossamer Gear Trail Ambassador, Guthook, has created apps for many trails including the AT, PCT, & CDT(coming soon). I’ve heard great things about his apps, but have yet to try them out. I now have his apps for the Appalachian Trail and Long Trail(trail I hope to do in VT after the AT) loaded on my phone and I love them already! Here is a visual. The app is really user friendly, has a ton of features, and everything I could ask for in the palm of my hand! There is a topo map to see where you are on trail with icons of important landmarks/locations that correlate with the A.T. Guide so there is no confusion when using both.. Each icon can be selected for detailed information that includes photos, information, and a trail register where hikers can make notes for others. 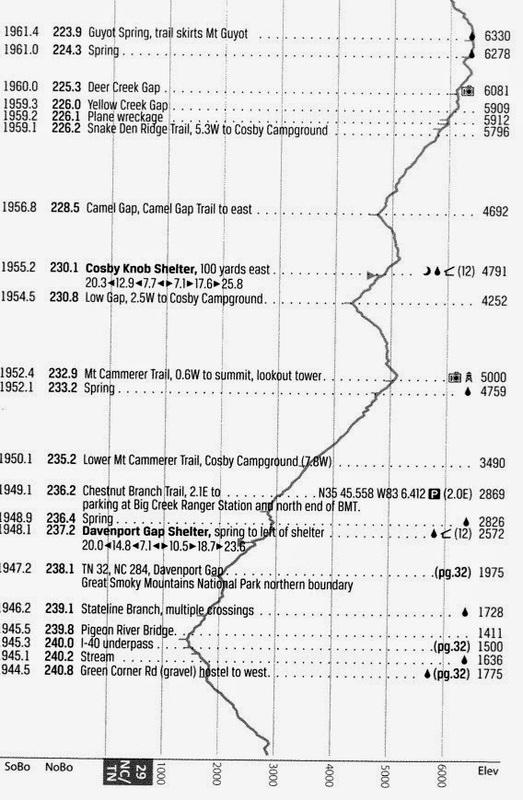 The elevation chart also has the icons. Excellent! Here is a video Guthook made if you want to see the app in action. For those viewing this in email or by smartphone, you’ll need to go to the actual website to view the videos below. Go to Guthook’s site to see all the video demos he’s made. I know many of you cringe at all this technology on the trail, but watch these videos of how the app works in use and you can’t help but be amazed at all it can do! I bow to you Guthook and look forward to meeting officially along the AT so I can bow in person! Many who hike like to just be spontaneous and have no schedule. Each hiker is different, but for my circumstances and coordinating purposes, I like to have a planner. Triple crowner, Peanut Eater made his own planner for the CDT and AT that he has kindly passed on to other hikers and I am SO GRATEFUL that he’s shared it. Here is a link for anyone that would like to download it. You will need to tailor it to fit your hike and where you plan to stop and you’ll need to double check hotels/POs, but it’s a good place to start! The planner helps me to see where I’ll be when and lets me see how many miles/days it is between legs. I used it on the CDT and I’m able to adjust it through Google Docs as I go and it immediately updates for anyone I’ve shared it with, like friends I’ll be meeting along the trail and Robin for resupply updates. I’ll be posting a version of it to my Care Package tab so people can get an idea of my schedule. I love it!!! Thank you Peanut Eater! Whew, I’m sure you’re tired from reading all this. Now just imagine having to actually plan it all! Almost there!